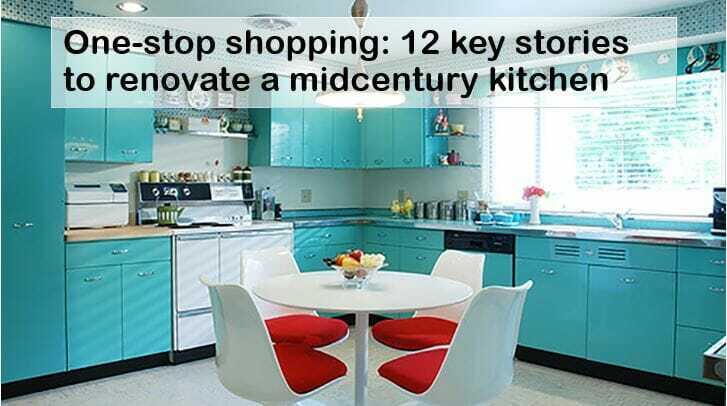 Ten years of Retro Renovation, and I have oodles of kitchen renovation research, design and inspiration stories in the archives, including some that feature mega-lists of where to shop for things you may need. Starting out the new year, here’s a look at some of the 12 key stories that may help get you started on a kitchen refresh, renovation, or remodel. Above: That’s my kitchen — the project that inspired me to launch the blog! Living with your existing space a while will help you (1) understand its issues better and (2) do lots of research, so that you can make potentially big fixes — like architectural improvements — once. I lived with my kitchen about five years before its big remodel. Along the way, I decided to enlarge the window, which required very careful planning — and made a huge difference. Full story here. My 9 tips before you start any remodel, plus 21 more tips from readers. This story is a must-read if you are new to your old house. It includes: Go slow, renovate safe, reality-checking the payback, reader input, and more. From the 9 tips, I will underscore this story, meant to counter the marketeers who constantly suggest you will get your money back and then some: Remodel and watch your “investment” plunge. And of course, be aware: Be Safe / Renovate Safe — hazards can be found in materials, layers, and products in our old houses, so get with pros to assess what you have so that you can make informed decisions how to handle. Do you have or want steel kitchen cabinets? Here’s my page on their history, along with a list of the 85+ brands identified so far. My kitchen features 1963 Geneva steel kitchen cabinets with their original aquamarine finish, which I salvaged from a cooking school in New York City once run by nuns. I don’t have personal experience refinishing metal cabinets — consult with pros. For modern-era-timeless wood cabinets, I recommend full-overlay, slab doors, typically with radius edge, medium-wood-tone cabinets. White also is modern-era-timeless. No roundup story, but you can read all our cabinet stories here. For kitchen countertops, I’m a #1 fan of laminate, because that’s what was used back in the day and is generally more consistent with the humble aesthetic of many if not most midcentury houses. 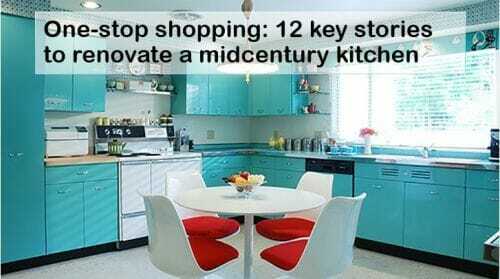 See: 10 places to find retro-design laminate for kitchens and bathrooms + my design tips. My round up research: Where to find metal countertop edging — steel, aluminum and faux. For countertop edging, there are several historically accurate ways to go. See: 10 ways to do countertop edges from 1953. << This story includes where to find metal edging — aluminum or stainless steel. I used Azrock Cortina Autumn Haze in my kitchen. It’s been around for decades, but ya gotta know how to ask for it. For the 1940s and prior, go with true linoleum. 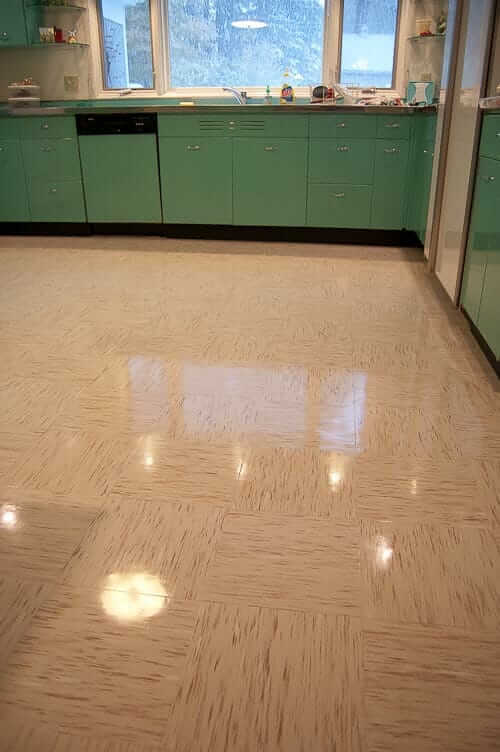 For the 1950s on, vinyl composite tiles were common. For the 1960s on, you could also do vinyl sheet. The Kohler Delafield white-enameled cast iron, double-bowl kitchen sink with hudee (metal) rim is a classic and still available — story here. Elkay stainless steel drainboard sinks also have been around for many decades — story here. And, oh my, the world loves drainboard sinks. Retro Renovation is not a fixit site. But, here are some places you may be able to get help if you need to fix or get parts for old appliances >> Parts, service and advice to fix old appliances. Restored-like-almost-new vintage appliances also are possible: 27 places to buy a restored vintage stove (and refrigerators too). These can get super spendy, but golly, they are gorgeous. New vintage-style appliances can be purchased — see my comprehensive guide where to buy retro refrigerators. In my Appliances subcategory, I also regularly feature less expensive proxies available from mainstream manufacturers. There are, for sure, a lot more details in any kitchen, but this list will surely get you started. To dive in further to lots more stories, click on the categories — in blue — at the top of this page to open the subcategories — in orange. What are the exact colors in you tile? What two creamy colored tiles match/come close to yours? Would you do over again picking this tile and color? Speaking of resale, when we remodel, it’s always about what we like and want. New buyers most always do some sort of remodeling. Even if it’s painting. What remodelers look for is the cheapest way to remodel. That could turn a lot of buyers away. So…my point is, there are so many reasons, not just one, for thinking resale. When I bought my home, my first and last home, decades ago I pictured the house and design in my head. I have seen hundreds of homes and new what I wanted. Went to a garage sale and there it was. FOR SALE! The son of the owners was also at the garage sale and invited me into the home. What was most important to me was the floor plan and the big yard. When I walked into this home and looked it over, I new I was going to buy my first home. Decades…later, I’m still here! And the bonus is, there is so much history here! My history!! And…it’s not for sale! I have never been one to throw money out the window. However, looking at the big picture when buying a home will make you more money then just thinking resale. I know, because four people, out of the blue, show up asking if they can buy my home. WOW! My tile is Azrock Cortina Autumn Haze. Click on the link in the story (bold blue text) to get to the story about how to get it. Good luck. And yes: I would for sure use it again. I love it. Azrock Autumn Haze is showing current on the website. 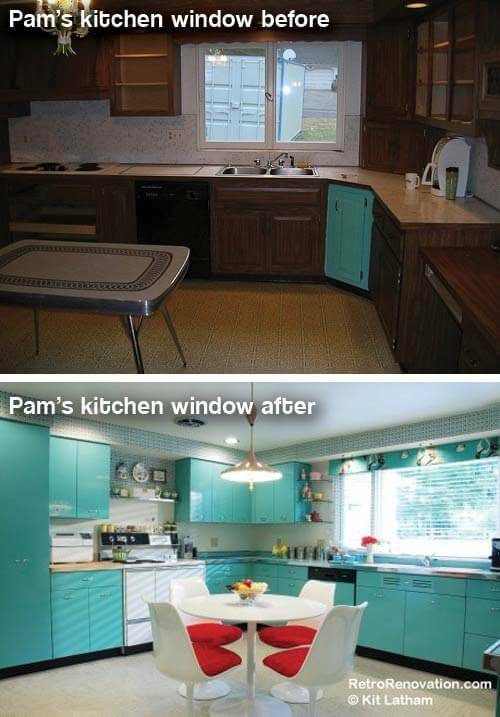 Pam, I cannot imagine your living with the “before” kitchen for more than a day! Ugh. But …. is it?